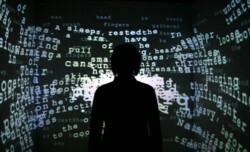 Screen was created in the "Cave," a room-sized virtual reality display. It begins as a reading and listening experience. 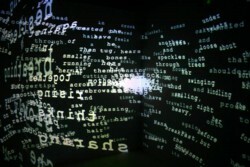 Memory texts appear on the Cave's walls, surrounding the reader. Then words begin to come loose. The reader finds she can knock them back with her hand, and the experience becomes a kind of play — as well-known game mechanics are given new form through bodily interaction with text. At the same time, the language of the text, together with the uncanny experience of touching words, creates an experience that doesn't settle easily into the usual ways of thinking about gameplay or VR. Words peel faster and faster, struck words don't always return to where they came from, and words with nowhere to go can break apart. 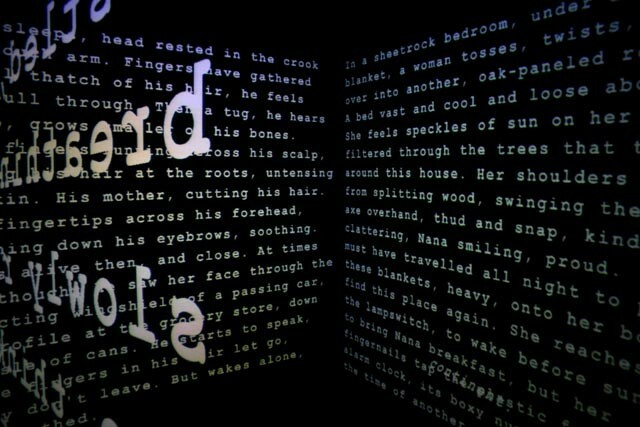 Eventually, when too many are off the wall, the rest peel loose, swirl around the reader, and collapse. Playing "better" and faster keeps this at bay, but longer play sessions also work the memory text into greater disorder through misplacements and neologisms. While the discussion of the relationship between games and literary forms is longstanding, Screen uses text as play material in a way that this discussion has not previously explored. 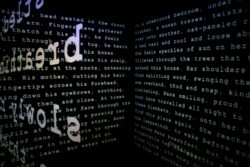 In addition to creating a new form of bodily interaction with text through its play, Screen moves the player through three reading experiences — beginning with the familiar, stable, page-like text on the walls, followed by the word-by-word reading of peeling and hitting (where attention is focused), and with more peripheral awareness of the arrangements of flocking words and the new (often neologistic) text being assembled on the walls. Screen was first shown in 2003 as part of the Boston Cyberarts Festival and has since been featured at The Iowa Review Web, presented at SIGGRAPH 2003, included in Alt+Ctrl: a festival of independent and alternative games, published in the DVD magazines Aspect and Chaise, as well as in readings in the Hammer Museum's HyperText series, at ACM Hypertext 2004, and in other venues. http://www.uiowa.edu/~iareview/tirweb — interview and video of Screen at The Iowa Review Web. http://hyperfiction.org/texts/screenSketch2.pdf — Screen sketch for ACM SIGGRAPH 2004 (authors alphabetical).